Starting in Budapest, it is a city in a stunning natural setting with a rich architectural and historical heritage, offering an unmatched combination of culture, fine cuisine and thermal baths. Ride from artist's town of Szentendre, biking along the Danube bend to Banska Stiavnica, an old mining town located up in the hills. Here the cycling gets more challenging, crossing the Low Tatras and West part of the High Tatras. Your reward is the superb panoramic views of the breath-taking Slovakian countryside dotted with traditional mountain villages, meadows and pastures. You will see traditional handcrafts such as carpets being hand made in the village of Malatina. 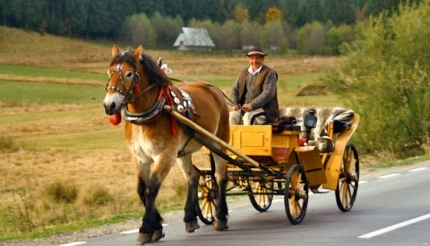 Biking into Poland you will visit the pilgrimage site of Kalwaria Zebrzydowska. Finish in Krakow, rivaling Prague with its historical monuments. is not only a historical and visual gem, it's Poland’s second largest city and covers both banks of the Wisla River. It is located the foot of the Carpathian Mountains, the metropolitan area has much to offer the traveller looking to discover a beautiful corner of the world.